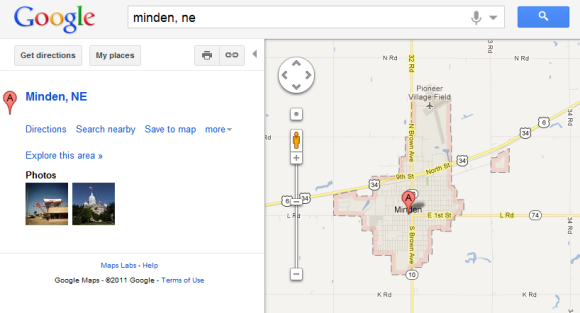 Rodney G., a reader of this blog noticed a new feature in Google Maps. "When you search for a city or a county or a ZIP Code, Google Maps now highlights the boundaries of what you searched for. If you are zoomed out, the whole area is shaded pink. If you zoom in a bit, it has just a big pink border with grey shading. Zoom in even more and it's a dashed boundary with grey shading." It's a really useful feature and the nice thing is that's enabled by default. 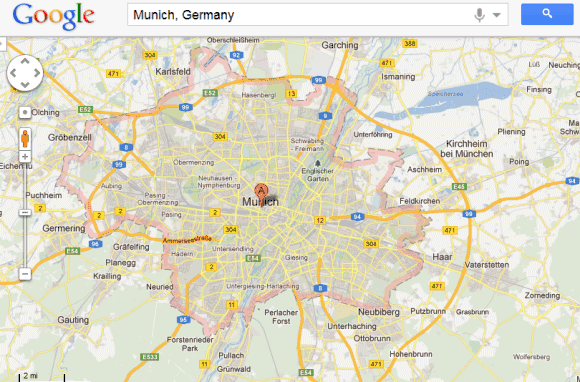 Just search for a country, a city, a state or a ZIP code and Google Maps will automatically highlight it. This is a great feature - I've always found it unsatisfying when I search on a large geographical region (e.g. austria) and get a map with borders t hat are hard to discern. Having just now tried the feature I note that it doesn't work everywhere. It works for Switzerland, France, Ontario, and Toronto, but not for Israel or Egypt! In fact, Venezuela is the only South American country that doesn't work with the pink border... weird. It doesn't necessarily work everywhere within a country - For example in the UK, London Derby and Leicester have a boundary whereas Manchester, Birmingham Newcastle and Nottingham (which are larger cities) do not. I believe this could be due to the boundaries that are shown are related to administrative boundaries. Manchester, Birmingham, Newcastle and Nottingham have different local government (council) areas covering what we commonly identify as the whole city. Oh, check this out -- you can overlay areas! For instance, search for Charlotte, NC. Then search for Mecklenburg County, NC. It will remove the Charlotte and show you the Mecklenburg. But now you can go up to the pulldown on the upper-right (where Traffic, Weather, Photos are) and select your previous search. Now it shows both areas overlayed. The UK post codes I've tried (mid-Sussex) return a marked area but it is not correct, e.g. I know the post code represents all addresses on one side of a road, but the area marked is roughly circular at the mid-point of the road. awesome feature there...it make life easier for laymen people ..
by "google maps" i mean "google maps js API"
Looking at these responses, we can't do this by default on google Maps JS API? This method for highlight works. The data set is greatly reduced for jsfiddle so if you zoom in you see deteriation in the plot. Give it a few seconds to load. Great. But how did you get the county boundaries in the first place? You're not using the API to get those. That doesnt work in Brazil..
For me, it works in Brazil too, if I use maps.google.co.uk or .hu, but not on .com - maybe some datacenters of Google have it already, while others do not. HOw to implement this feature using google maps api v3 ? yaps, that's right, how to use this feature in google maps api v3? Does anyone know about any official documentation on this? how do we get this included in a map we embed on our web pages? It is amazing and wonderful to visit this site. I've learn many things from this site.